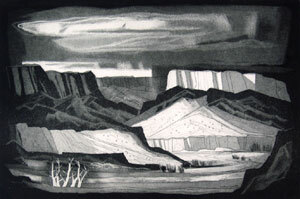 Doel Reed, Rio Grande, Aquatint on Paper, circa 1971, #11/30, 11" x 17"
Doel Reed is considered an important member of the Taos art community post-1960. Educated at the Cincinnati Art Academy, Reed served as the head of the Oklahoma State University art department from 1924-1959, with breaks in his tenure in 1926 and 1930-31 while he traveled in France, studying and sketching. He was elected to the National Academy of Design for his printmaking in 1952, and wrote a book entitled "Doel Reed Makes and Aquatint" in 1965. 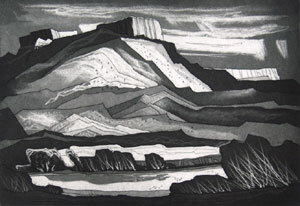 Doel Reed, The Gorge at Pilar, Aquatint on Paper, circa 1978, Trail Proof, Edition of 35, 10" x 15"
A master printmaker, Reed's prints are reminiscent of Gene Kloss' work in their high contrast and expert use of light and shadow. He worked in a variety of mediums, but is best known for his prints, aquatints and casein paintings. His work is in the collection of the Carnegie Institute, the Honolulu Academy of Art, Grinnell College, the Library of Congress, the Metropolitan Museum of Art, the Museum of Fine Art, Houston, the New York Public Library, the Pennsylvania Academy of Fine Art, the Oklahoma Art Club, the Philadelphia Museum of Art, the Philbrook Art Club, the Seattle Art Museum, Southern Methodist University, the University of Montana, the University of Tulsa, La Biblioteque Nationale, Paris and the Victoria and Albert Museum, London. 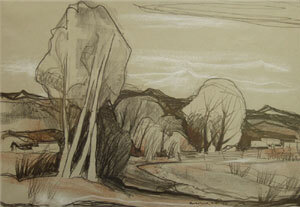 Doel Reed, Along the Rio Hondo, Conte Crayon, circa 1976, 13.75" x 19.5"